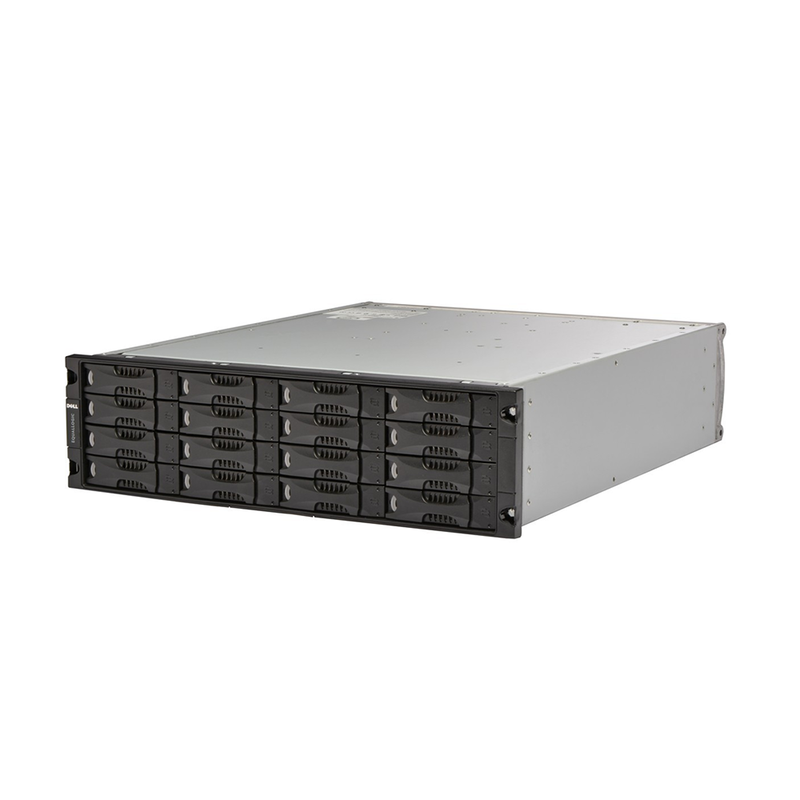 The Dell EqualLogic PS5000E storage array is an 8TB – 32TB system with 16x 500GB, 1TB, or 2TB SATA drives in a 3U enclosure. Whether you’re looking for parts or a complete EqualLogic storage system, we have what you need. If you don’t see the part listed that you’re looking for, please use our Contact Us form; as we have many parts in inventory that are not listed. Please note that all Dell EqualLogic storage arrays, systems and parts are used / refurbished, and backed by a 60 day warranty. The PS5000E iSCSI SAN is a complete system configured with dual controllers, dual power supplies, dual fans, a universal rail kit, and power cords. The PS5000E is an intelligent storage array that is designed to provide rapid installation, simple management, and seamless expansion. All PS Series storage arrays include SAN configuration features and capabilities that sense network topology, automatically build RAID sets, and conduct system health checks to help ensure that all components are fully functional. A PS5000E is designed to be installed, configured, and serving storage in less than one hour. Dell EqualLogic PS Series arrays are based on a virtualized modular storage architecture that enables IT managers to purchase only the storage they need, when they need it — helping to prevent both underutilization and over-provisioning. Using innovative data movement technology, all Dell EqualLogic PS Series arrays in a SAN work together to automatically manage data, load balance across all resources, and expand to meet growing storage needs. The Dell EqualLogic PS5000E Series is designed to meet and exceed the rugged requirements of the data center. The PS5000E includes fault tolerance capabilities through fully redundant and hot-swappable components — standard dual-controllers, dual fan trays, dual power supplies, and disk drives with hot spares. Dell EqualLogic PS5000E Series arrays represent a breakthrough in storage economics, from purchase and setup to operation and upgrades. Unlike traditional SANs, the PS Series comes complete with the available software and applications expected from an enterprise-level SAN. The PS5000E Series scales on-demand — and online — allowing storage growth without disrupting applications. As a result, Dell EqualLogic PS5000E arrays provide exceptional flexibility at a low total cost of ownership. Whether consolidating a direct-attached storage (DAS) infrastructure, migrating data from an existing SAN, streamlining data protection processes, or simply adding storage capacity, the Dell EqualLogic PS Series offers a family of proven, high-performance, self-managing storage arrays designed to meet the requirements of any SAN environment. The EqualLogic PS5000E can be configured with either a single controller, or dual redundant controllers. The single controller configuration will provide the same level of I/O performance as a dual controller configuration. The dual controller configuration provides for redundancy. Redundant controllers will prevent volume connections between hosts and SAN from being dropped in the event of an active controller failure. A link failure on one or more of the Ethernet ports on the active controller does not constitute a controller failure. For this reason, it is important to ensure that ports from each controller are connected to at least two different switches. This will prevent a switch failure from also disabling all paths between a host and its connected volumes.